From the soft classical notes floating over Tanglewood’s manicured lawns to the roaring rock chords bouncing off the grungy walls of Boston’s basement clubs, the range of live music performed across Massachusetts rivals even the most eclectic iPod mix. But in spite of that auditory affluence, there is one genre that music lovers may not readily associate with the Bay State: jazz. A new statewide tourism campaign, MassJazz, is seeking to alter that perception. The Massachusetts Office of Travel & Tourism, or MOTT, is a partner in the MassJazz initiative, and founder Michael Quinlin believes MOTT is the only state tourism agency in the country to help initiate a marketing campaign devoted to jazz. Quinlin, also the founder of the Boston Irish Tourism Association, hopes to make Massachusetts as much a destination for domestic and international jazz fans as New Orleans, Chicago, or New York. Jazz enthusiasts who go to the MassJazz website will find listings for hundreds of performances, festivals, clubs, and educational programs. “When people say Massachusetts is a cultural center, they’re not necessarily thinking of jazz,’’ says Eric Jackson, host of “Jazz on WGBH with Eric Jackson.’’ “But there’s fascinating jazz history, not just in Boston but in Worcester and the western part of the state as well.’’ Johnny Hodges and Harry Carney were among the Boston-based pioneers who began touring with Duke Ellington’s band in the 1920s. Pianist Chick Corea, drummer Roy Haynes, and saxophonist Phil Woods were all born in Massachusetts. In addition to its deep-rooted heritage, the state is still home to a flourishing jazz scene. “There’s no limit to your ability in this area to hear some great jazz along a wide spectrum,’’ Jackson says. From Pittsfield to Provincetown, there are more than 130 venues with live jazz. The vitality of the jazz scene here surprised even a lifelong aficionado like Quinlin. “I was startled to see how many grass-roots festivals and schools there are across the state,’’ he says. A lineup of jazz greats regularly comes through Boston throughout the year to perform. “Scullers in Boston and the Regattabar in Cambridge are among the best jazz venues in America and on the circuit for world-class musicians,’’ Quinlin says. “And the Berklee Performance Center is among the most important venues in jazz.’’ Joe Sample, David Sanborn, Kurt Elling and the Monterey Jazz Festival on Tour, and Gary Burton are among those who will be performing in Boston early this year. What makes Massachusetts, and Boston in particular, such a hotbed is that it’s home to some of the finest jazz study programs in the world, including Berklee College of Music and New England Conservatory. Jazz legends Diana Krall, Pat Metheny, Joe Lovano, Branford Marsalis, Quincy Jones, Cecil Taylor, and John Medeski are among the distinguished musicians who have taught or studied at the schools. “Boston is the jazz education center of the world. It’s a cutting ground for great young musicians,’’ says Tom Riley, Berklee’s vice president of external affairs. In clubs and festivals, fans get to hear not only students working on their chops but also the masters who are their teachers. One of the local clubs that’s a training ground for fledgling musicians is the legendary Wally’s Café in the South End. 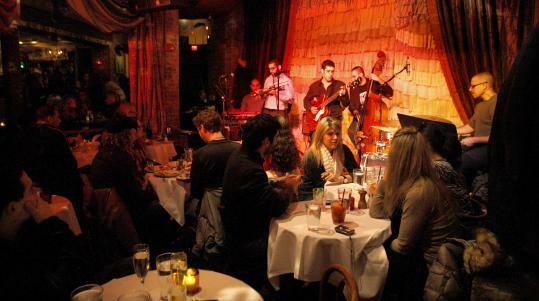 Dating to 1947, it has hosted jazz royalty such as Charlie Parker and Billie Holiday and has live music 365 days a year. “Wally’s is like an incubator where the music is hotter, fresher, and more spontaneous. There’s more of a jam session vibe at Wally’s compared to the Regattabar or Scullers, where the musicians are probably going through arrangements,’’ Jackson says. Across the South End from Wally’s is the Beehive, another popular club that features jazz acts along with jazz brunches and dinners. The Beehive is a funky venue, with sparkling chandeliers hanging from exposed ceiling pipes and decor ranging from ornate drapes to shelves with empty beer cans. The intimate surroundings allow you to get close to the musicians to watch the jazz flow from deep in their souls to their fingers plucking the double bass, sliding the trombone, and brushing the cymbals. Even though the round cafe tables in front of the elevated stage lend a supper club aura, the Beehive has plenty of highchairs for parents who want to bring their children along to brunch to enjoy some jazz with their eggs Benedict. On the other side of the Charles, Johnny D’s in Somerville and Ryles in Cambridge also feature jazz brunches on the weekend in addition to live performances throughout the year. Jackson says jazz fans who enjoy experimental acts should also check out Outpost 186 in Cambridge’s Inman Square. “The musicians at the Outpost stretch in different directions. It’s probably the most adventurous of the clubs out there.’’ Outside the city, the Acton Jazz Café, which hosts lives acts Wednesday through Sunday nights, is another highly regarded venue. When the weather warms up, so does the jazz with more than a dozen festivals on tap in the summer and fall. Marblehead and Salem host summertime festivals on the North Shore, and in central Massachusetts, the EcoTarium in Worcester has hosted a Friday night Jazz at Sunset series for two decades. Down on Cape Cod, percussion and horns are as much a part of the summertime sounds as the rolling surf and chirping crickets. “The vibrant jazz scene is actually one of the Cape’s best-kept secrets,’’ says Kristen Mitchell, the Cape Cod Chamber of Commerce’s vice president of tourism marketing. Mitchell says the Cape’s burgeoning jazz lineup has emerged as another vehicle for drawing visitors. The Provincetown Jazz Festival, JazzFest Falmouth, and the Cape Cod Jazz Festival at Chatham’s Wequassett Resort draw thousands of fans each year. In addition, dozens of Cape restaurants, such as the Nimrod in Falmouth and the Island Merchant in Hyannis, host live jazz. In the Berkshires, the Tanglewood Jazz Festival is a Labor Day tradition. This year’s lineup includes Elling, John Pizzarelli, Eddie Daniels, and Julian Lage. This year also marks the 10th anniversary of the Berklee BeanTown Jazz Festival, which draws as many as 80,000 people into a six-block area of the South End for a free outdoor musical feast that culminates 10 days of citywide performances. The lineup includes a mix of legendary musicians, emerging stars, and Berklee students, faculty, and alumni. There’s even an “instrument petting zoo’’ where kids can try their hands on keyboards, drums, and string instruments.